Happy New 32 Year, Mars! Today marks the start of a new Martian year. The Planet Four team wishes everyone a very Happy New Year! That’s right, today July 31 2013 on Mars, Year 31 turns into New 32 Year. As a Martian year, (a complete 668 days around the Sun) is nearly twice longer than the Earth’s, it is a rather special event. Time to celebrate! The counting of martian years started on April 11, 1955, this was the date of Ls=0 back in that time. Since then the moment when Mars completes its turn around the Sun shifted for us, Earthlings, from April to July. It will continue to shift further, because martian year is close but not precisely equal to 2 terrestrial years. To give you a perspective, Planet4 is 7 months old now, this means, only a bit older than a quarter of a martian year! In contrast to Earth, New Year comes to Mars when northern hemisphere is in spring, and it is fall in southern hemisphere. For areas that you are analyzing this means rather boring time: all the ices are gone from the surface and the ground stands bare and inactive. But even inactive, the scenery is still very impressive. 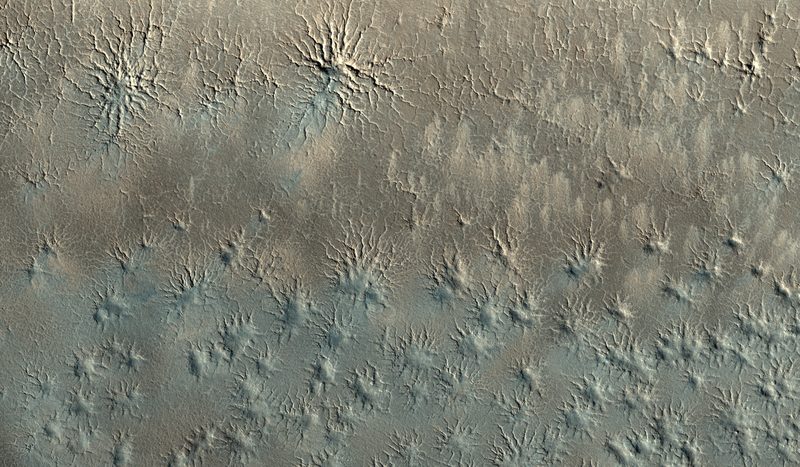 For the New Year celebration we decided to share with you a glimpse into a very fresh HiRISE image. It was taken only a week ago. Some of you might recall the area you were studying! Now there are only dim reminders of the fans that you are marking for us so efficiently. Thank you for doing it with us and lets celebrate by classifying an image or two! Happy New Year! This is the blog for the online citizen science project Planet Four . We're asking for your help marking features on the surface of Mars.